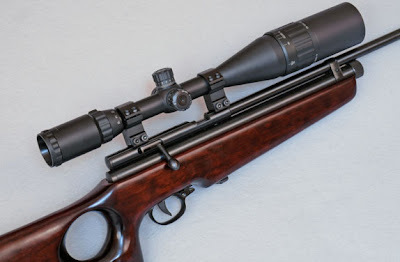 Mil-dot scopes are very popular with air rifle shooters, but normally we do not use them in the way that the manufacturer originally intended. Mil-dot reticles are intended by manufacturers for estimating the distance from shooter to target. Leapers scopes, for example, have the reticle arranged at the second image plane, therefore as the magnification changes the size of the reticle does not change as the image zooms. But, of course, air rifle shooters normally use mil-dots for holdover, aiming off or Kentucky windage - all different names for the same thing: estimating a correction for windage or elevation without making alterations to the scope's turret settings. As all Leapers scopes have their mil-dot reticles calibrated for 10 x magnification (even if a particular scope cannot actually be set to 10x magnification), the mil-dots can be used quite consistently and simply for holdover sighting. At 4 x magnification with Leapers scopes, 1 mil-dot separation equals approximately 1-inch on the target at 10 yards, 2-inches at 20 yards or 4-inches at 40 yards. At 8 x magnification, 1 mil-dot separation equals approximately 1/2-inch on the target at 10 yards, 1-inch at 20 yards or 2-inches at 40 yards. Our photograph shows the Leapers 4 - 16 x 50 AO scope mounted on an AR2078 air rifle. The Archer Airguns Late Summer Sale Begins!